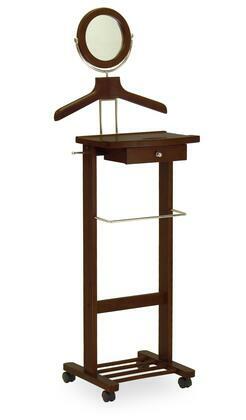 The Vanity Valet Stand can accommodates a shirt, jacket, trousers, and pair of shoes. 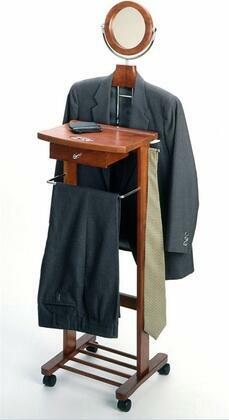 The dresser valet stand is the perfect gift for him. This valet features a center storage drawer perfect for keys and a wallet, and a tilt mirror for a quick morning brush up. The base holds a pair of shoes. Includes four casters for easy mobility. Overall assembled product size is 19.84"W x 14.96"D x 55.33"H. Made from solid wood in Antique Walnut Finish. 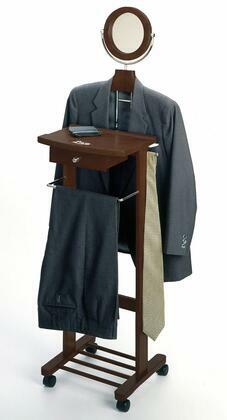 Overall Valet assembled size is 19.61" Wide x 15.93" Deep x 57.48" High. Round Mirror, Tray, One Drawer, Metal Pants Hanger, Base for Shoes. Made from solid and composite wood in walnut finish. Assembly Required.